Note: This program is designed to work in conjunction with the face-to-face interactive workshops provided by Your Staff Wellbeing. Please contact us to learn how your organisation can be assisted. This part of the Online Program provides an overview of the strong link between wellbeing (resilience) and performance (results) and outlines the 4 levels of wellbeing, performance and energy and how they are all inter-connected and essential. We're at our best when we move between expending energy and intermittently renewing our four levels of wellbeing: physical, emotional, mental, and spiritual. When you're intent on caring for each dimension of wellbeing and energy, you're going to be healthier and happier while being able to contribute more to your organisation’s success. The Growth Mindset (Professor Carol Dweck) is an important foundation for our ability to learn and change. ​Read this news story about the Australian school kid with no brains or sporting ability who used a growth mindset to become a professional rugby player and then a doctor! Never doubt that you can change, grow, and even rewire your brain! The two videos below are helpful in supporting your ability to change on a physical, emotional, mental, and spiritual level. For over a decade Professor Carol Dweck from Stanford University and her team studied the effects of praise on students. This study involved a series of experiments on over 400 5th graders from all over the country. Everyone, especially parents, need to watch this 5 minute video! Professor Carol Dweck 'Teaching a growth mindset' - 43 minute presentation at the Young Minds 2013 conference. Good advice on how to help others develop this powerful support for individual growth and change. Optimal Wellbeing & Performance by managing the 4 levels - Tony Schwartz at Google (Leaders professional development) in 2008 - 101 minute presentation by the co-author of The Power of Full Engagement. Talk begins at 1.58 minutes. Managing Energy for Wellbeing & Performance - (right click the link to download or just listen below) Tony Schwartz at HCI 2012 - 59 minute keynote presentation. Some content is similar to the video above with Tony Schwartz however if you listen to this audio a few days later you will get new insights as well as reinforce key learnings. 15 Tips to Boost Your Well-Being and Happiness - A quick read about a broad range of tips that impact the 4 levels of wellbeing. SuperBetter.com - SuperBetter is a free online game that focuses on things you can do to improve your wellbeing and resilience on all levels. It could be used to identify, promote and track wellbeing activities with individual service users. Great for people who used to computer game formats although it doesn't have the dynamic visual action most games have. It can however help you achieve your health goals — or recover from an illness or injury — by increasing your personal resilience. Resilience means staying curious, optimistic and motivated even in the face of the toughest challenges. Dweck explains why it’s not just our abilities and talent that bring us success – but whether we approach them with a fixed or growth mindset. She makes clear why praising intelligence and ability doesn’t foster self-esteem and lead to accomplishment, but may actually jeopardize success. With the right mindset, we can motivate our kids and help them to raise their grades, as well as reach our own goals–personal and professional. Dweck reveals what all great parents, teachers, CEOs, and athletes already know: how a simple idea about the brain can create a love of learning and a resilience that is the basis of great accomplishment in every area. If given the choice, we would all choose to be less stressed, feel happier, and experience a more optimal state of wellbeing. So why are these outcomes so hard to achieve? The answer is quite simple. No one has taught us how. It turns out that just as you train your body for fitness, you can train your mind for wellbeing. We call this Life Cross Training (LIFE XT), and Start Here is the manual for anyone seeking to achieve emotional satisfaction. Combining ancient wisdom with modern neuroscience from the world’s leading experts, LIFE XT is a groundbreaking training program to master the art of wellbeing. The program teaches practices that are proven to rewire the brain for increased focus, engagement, and resilience to stress. You can quickly download this book (256 pages) from Amazon to read in Kindle for $3. 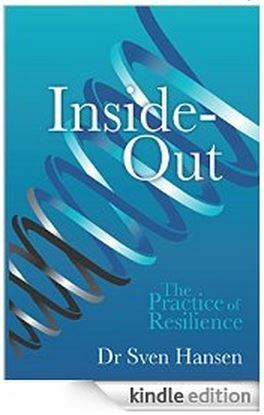 Mitch Lawrie trained as a resilience facilitator with the organisation behind this book in 2010. 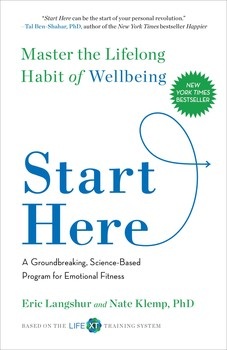 While Dr Hansen doesn't appear to be aware of the inside-out approach suggested by Syd Banks and Michael Neill (author of the Inside Out Revolution), Dr Hansen's book still offers valuable insights. Inside-Out is written to counter fear. By enquiring deeply into who you are and how you operate, you can discover much better ways to live and be. This is the practice of resilience – learning to be calm, energized, engaged, focused and in flow. We can all learn to be more resilient. Each of the practices described are soundly based on evidence and deliver results. Some steps such as sorting out sleep, nutrition and exercise are easier to understand and harder to perfect. Other steps such as coherence, positivity and meditation will be more complex to understand, yet can be surprisingly rewarding to initiate. So throw away the pills and creams. Join Sven on this journey of discovery and creative expression. Let your inside-out. The Power of Full Engagement is a highly practical, scientifically based approach to managing your energy more skillfully. It provides a clear road map to becoming more physically energized, emotionally connected, mentally focused, and spiritually aligned -- both on and off the job. This is an optional read. Good if you want to extend your understanding of how to get over major set backs in your life especially if it involves overcomes the effects of trauma. You have survived the crisis—trauma, divorce, disease, accident, or war—now how do you get your life back? The survival experience changes everything because it invalidates all your previous adaptations, and the old rules don’t apply. In some cases survivors suffer more in the aftermath than they did during the actual crisis. In all cases, they have to work hard to reinvent themselves. Drawing on gripping cases across a wide range of life-threatening experiences, Laurence Gonzales fashions a compelling argument about fear, courage, and the adaptability of the human spirit.